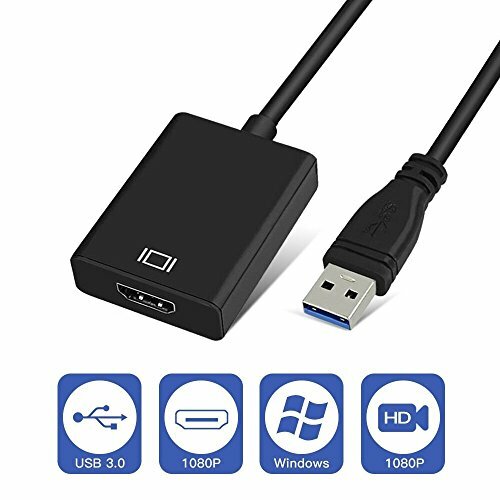 ① This USB3.0 to HDMI Adapter only works for the computer which is running Windows 7 / 8 / 10 operation system. ② Please try to install its internal driver directly. After plugging it into your computer, you will see there a new USB device folder in your computer, then double clicks to install the driver. ③ If you can't get it work, please manual download the latest driver as below, then install the driver and RESTART your computer. (Please remove the adapter while you restart computer). For Windows 7 / 8 / 10 users: You have to download the latest driver from our website Please search " Download - Hoplaza " from GOOGLE. ④ It's better to turn off anti-virus software and low down the firewall level before install the driver. You can turn on them after the installation. ⑤ If it can't convert picture well, please right click the Computer - > Device Manager - > Universal Serial Bus Controllers, then check out if there is an USB 3.0 interface. Also check whether the HDMI extend cable version you use is 1.3B. ⑥ If your computer only has USB 2.0 port, DO NOT RECOMMEND TO USE this adapter. It also supports USB2.0 port, but the max resolution is 800*600 only. 【USB to HDMI Converter】 This USB to HDMI adapter can connect a computer via USB interface to an HDTV, monitor, or projector with HDMI interface. It will deliver high-definition audio video sources in computer to your HDTV or monitor. --- Noted: it's only compatiable with Windows 7, Windows 8, Windows 10. 【High-Definition Graphic Images】Leveraging the high-bandwidth (5 Gbps) SuperSpeed USB 3.0 interface, this USB 3.0 to HDMI offer a high-definition graphic images to your HDTV or monitors at resolution up to 1920x1080, so the external video displaying problem of the computer will be solved easily. 【 Simple Operation 】 Please install it's internal driver directly or manually download the driver from our official website. Plug it into your computer, then open the USB device folder and double click to install the driver. 【Portable】This USB3.0 adapter is lightweight to carry in your laptop bag when traveling. It's great for connecting your computer PC to a projector to mirror or extend your display desktop when you are in a classroom or a conference room for showing a presentation.